After Europe’s new data privacy regulations, GDPR, went into effect on May 25, OpenSim users saw a flurry of requests from grid owners asking them to agree to new privacy policies. Sometimes, those messages would pop up in the middle of a hypergrid trip, hindering travel. DigiWorldz , for example, has adopted a system that blocks users or prevent them from accessing the grid until they are able to agree to terms of service. This affects local and hypergrid users alike. “We have implemented a system which, when a local user tries to login, or a hypergrid users tries to visit, we first check to see if they have authorized their avatar,” Terry Ford told Hypergrid Business. Clicking the provided link takes users to a web authorization page, and, after authorizing their avatars, they can then continue as usual. In theory. In practice, some hypergrid users find it hard to access the grids either because they do not read instructions detailed on each page about the information they ought to provide or do not understand them at all, said Ford. “If they do not enter the correct information, they will never get in,” he said. Other grids are also reporting that hypergrid visitors are having problems getting in. The DigiWorldz pop-up automatically directs users to the website when they click the OK button. Craft, however, requires them to right-click the links to to the page where they can agree to the new terms. In addition, not all viewers have clickable links in their pop-up messages. Firestorm, the most popular viewer, does. Other viewers require users to copy the link, open their browser, and paste in the link manually. “This is work, too much for some,” Macis said. 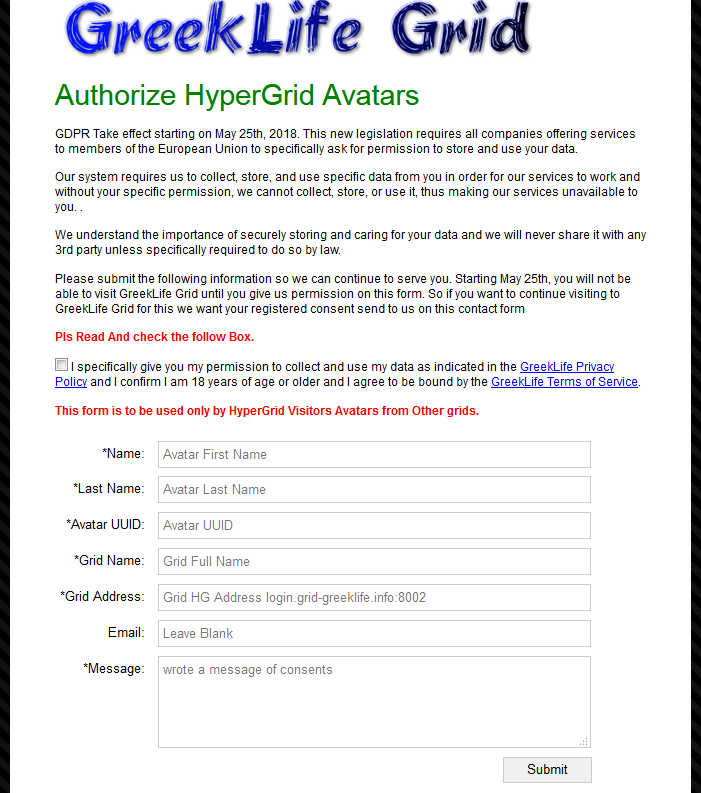 Great Canadian Grid  also requires local and hypergrid users need to authorize their avatar  to access or before they can login, according to its new terms of service for compliant to GDPR, grid owner Roderick MacDougall told Hypergrid Business. Baller Nation  has also updated its policy to comply with GDPR. 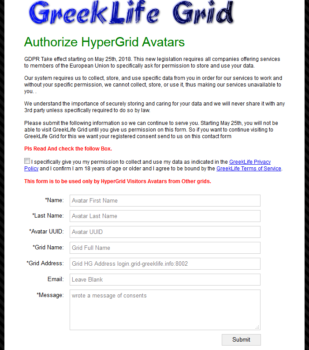 It requires users to authorize their avatar  for local and hypergrid visitors. All local users of both Openvue  and AiLand , which are run by The University of Edinburgh is a charitable body, registered in Scotland, have been notified and given contact information for the grid manager. A section has been added to the TOS to give grid manager contact details and to explain what is logged and for how long this is retained. “Both grids have only a few local avatars who have regions and creator roles,” grid owner Austin Tate told Hypergrid Business. 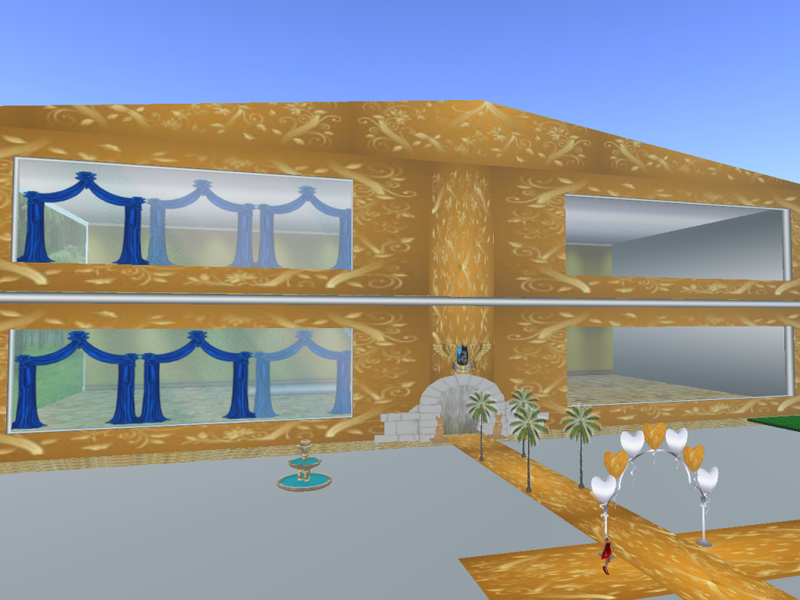 “Most use is it as an openly accessible hypergrid destination. Snikygrid , which is located in Germany, also posted a message to users about the changes in policy and TOS including the fact that their IP addresses, Media Access Control addresses, usernames, passwords and optionally, e-mail addresses are collected and stored securely to facilitate provision of services. Some grids went even further than just updating their terms of services and requiring consent. GreekLife , in addition to adding a new approval step for visitors, also did a grid restart to delete all historical logging data just to be on the safe side. “GreekLife never saved any real information, just email for news and grid updates, all payments are made with the security of PayPal so nothing changed,” a GreekLife spokesperson told Hypergrid Business. TangleGrid , citing “crazy European bureaucracy,” sent out notices three weeks in advance asking users to agree to the new terms or have their accounts deleted. One grid going even further than Tangle is 2Worlds2Go , which plans to delete all user data — everyone will need to get a new login to the web and grid all with consent. When it comes to dealing with data and information relating to money, the grids with internal monetary systems might need to do a little bit more than others. Grids that have internal monetary systems and that deal with real money need to protect the transaction and billing information it collects, Kitely  CEO Ilan Tochner told Hypergrid Business. Kitely, for instance, uses secured networks in addition to encryption and keeping the information accessible to only a limited number of persons with special access rights to the systems and are legally contractually required to keep the information confidential. It took months of full time work to develop the tools required to handle GDPR compliance, he said. Kitely requires children under the age of 16 to get the parents’ consent for the collection and storage of those children’s personal data before they are allowed to use Kitely. This verification step is available for local users but not for hypergrid users, so Kitely only allows people over the age of 18 to teleport in via hypergrid. The grid is also ensuring storage of minimal amount of user data. It does not store billing information configured for the PayPal accounts. That information is kept securely by PayPal and is never shared with the grid. Allowing users to agree by simply clicking “OK” in the pop-up message itself would make life easier for users, but hypergrid based-instant messages are not reliable enough, said Tochner. And if the grid waits to ask consent until after the user has already teleported in, then it may be too late. For some users, this sounds like a case of forced consent — if they don’t agree to the terms, they lose access to the grid, which is a form of blackmail. In fact, Google and Facebook are currently being sued for $8.8 billion  for forcing people to agree to new terms or lose access. That’s a different situation, said Tochner. Podex, which is a third-party currency exchange, is avoiding the GDPR compliance issue by virtue of not collecting any client unnecessary data from inception. The only data stored is the avatar name and its IP address. Gloebit, another popular money system in OpenSim, is already GDRP compliant. “We have always taken our users’ data and privacy very seriously, and as such, we have no major changes planned related to GDPR,” Gloebit CEO Christopher Colosi told Hypergrid Business. In addition to asking for user consent about data usage and storage and informing users of any breaches when it occurs, Gloebit does not store any payment information. Any other personally identifiable information is stored in encrypted form in their database. When personally identifiable information is shared with third parties, those third parties also need to be GDPR-compliant. HTTPS is a secure Internet communication protocol where the messages are encrypted. However, not all OpenSim grids use secure HTTPS for their communications, instead using the less secure, unencrypted HTTP protocol. The cost of failing to comply with GDPR is up to 20 million Euro or 4 percent of the company’s annual global turnover, which ever is higher. Any company that provides services to European users is vulnerable, no matter where it is located — or how big it is. That’s been a wake-up call for many companies. Across the Internet, some media and gaming companies have shut off access to European users or closed down completely to avoid dealing with the pain of GDPR compliance. WarpPortal  closed 16-year-old MMO Ragnarok Online. Edge of Reality’s free-to-play shooter Loadout is also closing, according to their announcement . In OpenSim, Immersive Reality  grid became the first casualty of GDPR. The grid shut down at the end of April mainly due to GDPR regulations, according to their announcement , although there were other issues causing the closure as well, including lack of interest.